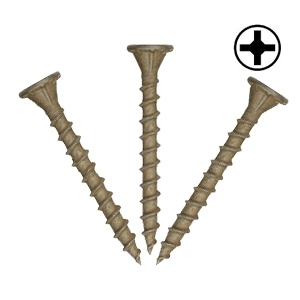 PRODUCT: #8 x 1-5/8" SCREWS, MODIFIED WAFER HEAD WITH FLUTES, SELF DRILLING SHARP POINT, #2 PHILLIPS, COPPERHEAD® COATED, FOR FIBERBOARD TO WOOD. COLLATED, 1000/BOX, PRICE/BOX. * Specify DRIVER BIT before adding to cart.